Fans of Atebits’ classic OSX Twitter client Tweetie, have been awaiting a major update to the app ever since its developer was acquired by the microblogging company last Spring. With no positive noises from the Twitter camp since the acquisition, it looked like all was lost until yesterday when news broke of a possible sequel to Tweetie arriving with the Mac App Store. The rumour was true, and it’s available now to download now for free. 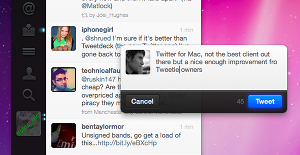 Let’s get this out of the way immediately, it’s no Tweetdeck. While it supports multiple accounts, there’s no multi-column mode for viewing many streams, searches and lists at once. This is entirely a single column affair. However, while this is no pro-Twitter app in the same way Twitter for iPhone is, it is a beautiful, lightweight client offering just enough features to keep most users perfectly happy. The biggest improvement we’ve noticed over Tweetie is that Twitter for Mac now supports User Streams, meaning you get tweets in real time without having to set refresh rates. In fact, this is the first official Twitter app to support this relatively new way of delivering tweets. What some may really like about User Streams as they’re implemented here is that you don’t get a continuous, frightening stream of tweets cascading down your screen. Instead, the stream is updated in real-time but the timeline stays where you last left it and you have to scroll up to read new tweets. This means you’re never lost for your last place, but it does mean that those who prefer to keep their Twitter app in the corner of the screen, updating without any input, will be frustrated here. 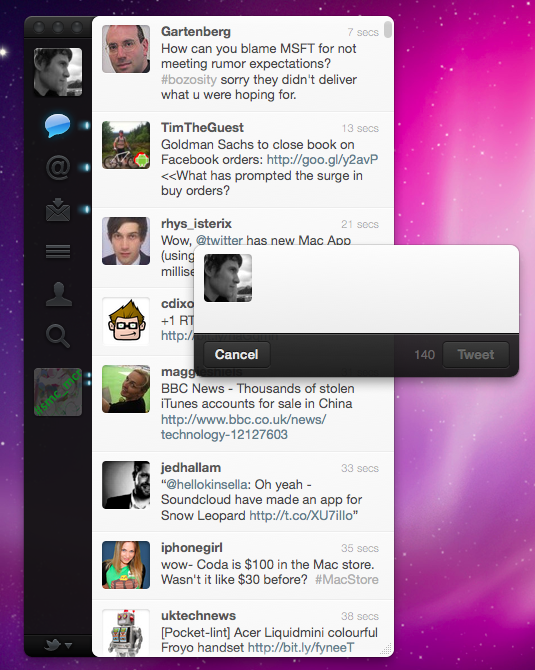 In all, Twitter for Mac feels like a perfect fit for the OS. Graphical flourishes like the sliding panel animations as you switch between accounts and feeds echoes the official iPad app, although there’s no in-line media display here. Arguably, there doesn’t need to be – you’ve got a perfectly good desktop browser at your disposal after all. 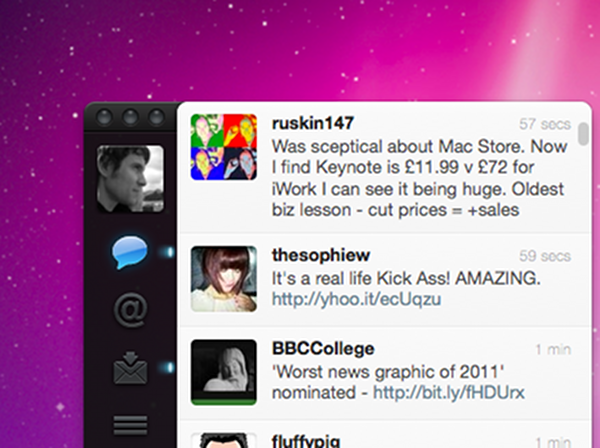 So, if you’re a casual or moderately serious Twitter user who doesn’t need an “all-in-one” view of the Twittersphere, Twitter for Mac is a highly recommended install from the Mac App Store.